Since 2. 11. till 24. 12. we open 9:00 a.m. - 5:00 p.m. In other days after telephone reservation. During holidays 25. 12. - 3. 1. we are open daily 9:00 a.m. - 5:00 p.m. Since 5. 1. till 31. 3. we are open again on Saturdays and Sundays 9:00 a.m. - 5:00 p.m. In other days after telephone reservation. We are looking forward for your visit. 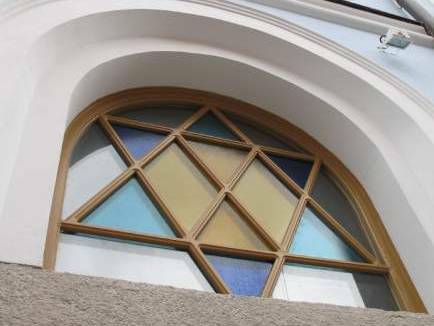 The Mountain Synagogue in Hartmanice Welcomes You! Since 1883, it has been a house of prayer for more than 200 citizens of Jewish faith, later a carpenter’s workshop, and even a warehouse for used truck tires... Now, after almost 70 years without dignity, the Hartmanice Memorial Association has reopened the synagogue with the highest elevation in the Czech Republic. Webdesign & website - Neternity.cz, CMS Atrium.